Our stable and easy sit-on-top kayak tours offer the perfect way to explore the best Scilly has to offer, getting close to wildlife and areas inaccessible by boat. 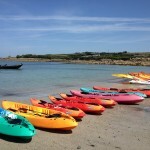 Paddling amongst the islands off Old Grimsby to Tean and St Helen’s, cruising the shallows along St. Martins or Tresco. Tours predominantly start from our Tresco base.